My wife and I just returned from a great trip to Chelem, Yucatán, where we visited our good friends Jeff and Nancy Gerlach. Nancy was my coauthor on ten books, and when she retired, they decided to sell everything they had in Albuquerque and move to their favorite spot on earth. Like Baja California Sur, the state of Yucatán is far removed from all the violence associated with the narcotraficantes who operate mostly in the central and northern parts of the country. In fact, the most violent thing we saw was one of the Gerlach’s cats, Mixo (pronounced “Misho”), climbing up a tree to catch a lizard. One day we took a 2-hour car trip to Rancho Santa Cruz, owned by Gil and Cristie Romero, which is halfway between Cancún and Mérida. They grow habaneros, neem trees, and and tilapia. The neem trees produce an oil which is used in lotions and cosmetics—and also as a type of insecticide which repels the bugs rather than killing them instantly. The tilapia are grown in large tanks and are eventually sold to restaurants. 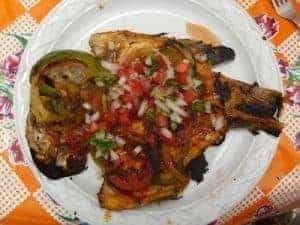 For lunch, Christie and her helpers served us Tik en Xic, a Maya specialty where the fish are covered with a paste of recado rojo (made of achiote, or annatto), then placed in banana leaves and grilled. They are served with an habanero salsa. The trip was a fascinating experience, especially when we saw a coatimundi cross the road in front of us. And lunch, with a recipe below, was delicious. Marinate the tilapia fillets in mixture of Recado Rojo, orange juice, water, lemon juice, vinegar, and garlic for 1 hour. Cover the fish with the slices of onion and chopped tomato, and then lightly salt the fish. Start the grill and place each fillet on a banana leaf. 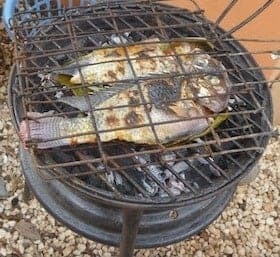 Place the fillets fish down on the grill, covered with a banana leaf and grill for about five or six minutes, and then flip them so the banana leaves are on the bottom. Grill for another five or six minutes, then flip again the brown the fillets until done. Serve with the Habanero Salsa to spice them up. Here is a classic Yucatán seasoning paste From Jeff and Nancy Gerlach, who comment: “This is the most popular of all the different recados and is very typical of Yucatán. It is used to add both flavor and color to foods, and is most commonly used for pibils, or stewed pork dishes. The red color comes from the annatto seeds, which also add a unique flavor to this tasty paste. Place the annatto, oregano, peppercorns, salt, cinnamon, cloves, allspice, and cumin in a spice or coffee grinder and process to a fine powder. Add the remaining ingredients and grind to a thick paste, adding a little water if mixture is too thick. Allow to sit for an hour or overnight to blend the flavors.